The Tour of Elk Grove was two weeks ago in the Chicago area. 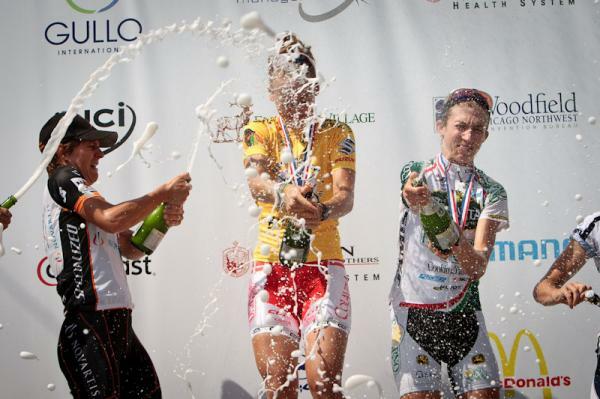 This was the first time in a few years that a women’s 3-day stage race was back on the racing schedule. Always great to see more women’s events! 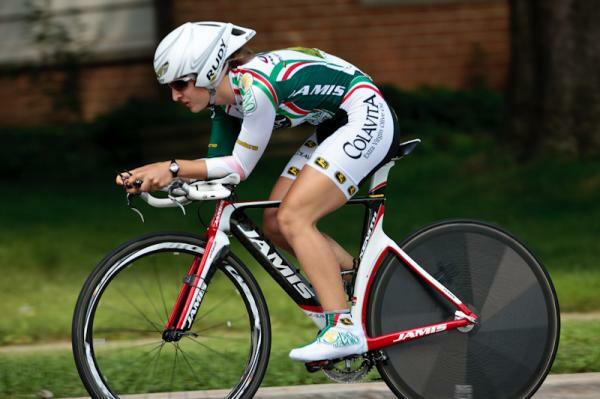 The event consisted of a 7 km time trial, and then two 50-minute criteriums. The times were all very close after the first time trial. 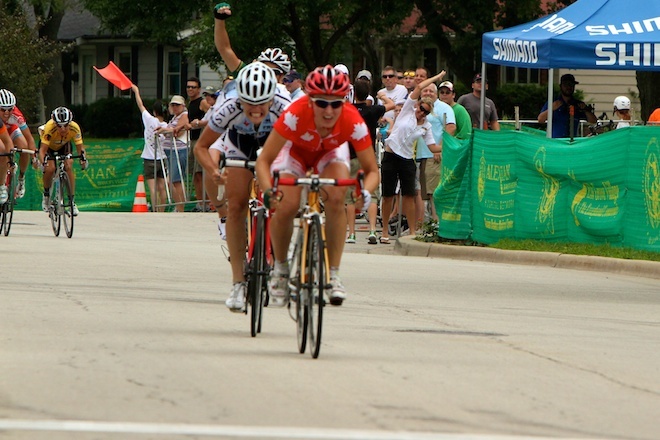 Janel was sitting 2nd, just 6 seconds back from Anne Samplonius (NOW). I was next best placed in 7th, 18 seconds back. With time bonuses up for grabs in the 2 crits, the sprinters were ready to battle the time trialists. The team decided going into the first crit that it would make the most sense to try and get me the 10 second bonus at the finish. If I could win both days, it would lead to the overall win. There were intermediate time bonuses (3 sprints, points on each sprint, people with the most points at the end get 3, 2, and 1 seconds respectively. Confused yet? Me too.) In any case, Lauren and Theresa did a great job going for those sprints, we couldn’t afford to let the high ranked GC riders any time. Going into the sprint, the team did a great job of making the race fast getting me into perfect position. Theresa was perfect as last lead out and powered by everyone like they were standing still. It was so fun to get a lead out from one of the best sprinters in the world! I got the win and 10 seconds, and Theresa was 3rd. Janel rode a great race and maintained her 2nd overall, and I moved into 3rd, now just 8 seconds back. Some happy people in the background! The final stage was intense. The only way I could win the overall would be to win the race, getting the 10 second bonus, and if Anne did not pick up any time bonuses in the race. The team once again rode a fantastic race, and it all came down to a bunch sprint again. The last lap was slightly terrifying. The other teams were definitely doing their best to keep me out of the sprint. Somehow I made it through and Theresa once again delivered a world-class lead out. I won the sprint, and the Yellow jersey! I’ll admit, it was close though, Anne, normally a pure timetrialist channeled her inner sprinter and placed 4th on the stage, very close to taking the time bonus for third. Janel finished third overall on GC to add to the overall awesomeness of the race! She maintained her lead in the NRC standings and this race moved me into second overall. Other exciting news: The team has a current obsession with nail polish, largely fuelled by our soigneur, Ronnie’s passion for buying the nail polish. Somehow via twitter, this passion for nail polish sparked an impromptu auctioning of Chad Andrew’s nails, the announcer of the previous week’s Presbyterian criterium in Charlotte (won by Theresa!). Over $2000 was raised for 24 Hours of Booty and the brain tumour foundation. Just goes to show the power of social media… and nail polish! Excellent result and good race story too. You and Karlee are doing really well.